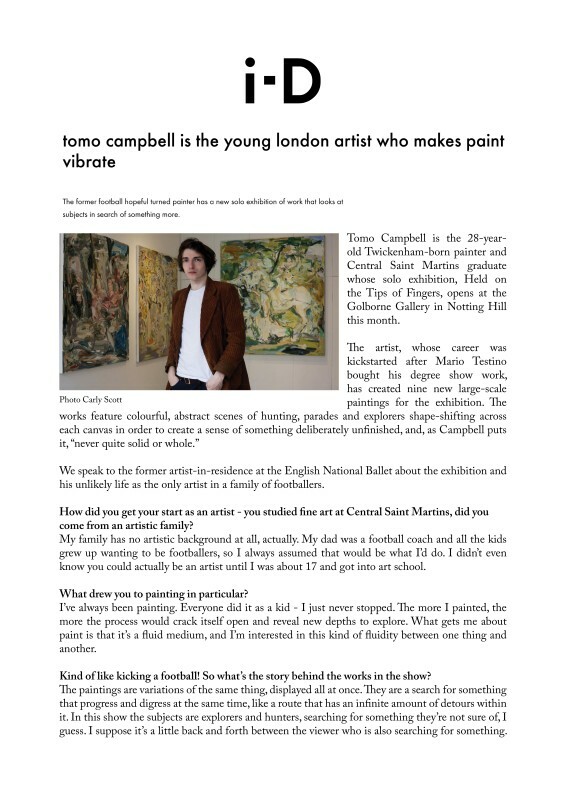 Tomo Campbell is the 28-year-old Twickenham-born painter and Central Saint Martins graduate whose solo exhibition, Held on the Tips of Fingers, opens at the Golborne Gallery in Notting Hill this month. The artist, whose career was kickstarted after Mario Testino bought his degree show work, has created nine new large-scale paintings for the exhibition. The works feature colourful, abstract scenes of hunting, parades and explorers shape-shifting across each canvas in order to create a sense of something deliberately unfinished, and, as Campbell puts it, "never quite solid or whole." We speak to the former artist-in-residence at the English National Ballet about the exhibition and his unlikely life as the only artist in a family of footballers.